Secret documents, leaked by Greenpeace, revealing confidential trade talks held between the European Union (EU) and Mercosur, the South American trade bloc (Brazil, Argentina, Paraguay and Uruguay), suggest that the agreement, which negotiators hope to clinch by year’s end, could exacerbate environmental problems in Mercosur countries, despite the inclusion for the first time of human rights clauses, aimed at protecting indigenous groups. While this new European concern with indigenous rights will be welcomed by activists, the underlying environmental problem with the agreement – that it will further encourage Mercosur country exports of agricultural products, particularly beef and soy – remains. With almost all arable land in Argentina and Uruguay already planted with soy and corn, the majority of “available” land is found in Brazil. However, as Mongabay has reported in many articles, the expansion of soy farming and cattle ranching there drives deforestation and the destruction of precious ecosystems. “Mercosur countries want to boost meat exports to Europe, which would push cattle farming into pristine habitats in the Amazon and the Cerrado regions in Brazil, and the Chaco in Argentina,” said Greenpeace trade campaigner Kees Kodde. According to Greenpeace Netherlands, which obtained 171 pages of previously undisclosed documents, the leaks expose the failure of the European Commission and European state governments to stick to commitments on transparency. With so much secrecy surrounding the talks, Greenpeace says, it has been impossible for analysts to assess properly the impact the deal will have on Mercosur nations. And now, as the accord nears finalization, there is little time left for public comment or input. The leaked documents show that both trade blocs are seeking to maximize market access while also increasing exports. The European Union’s focus is on exporting financial services to Mercosur countries, and gaining market access for energy companies, cars, motor parts and beverages, among other businesses. The EU wants European companies to be able to bid on procurement contracts at the local level, including contracts with big municipalities and federal states. The Mercosur countries want easier access for their exports, largely agricultural goods, to a large and wealthy EU market of about 250 million consumers. Although being presented as a win-win deal that benefits both sides, the agreement is controversial. Critics, however, see this as lip service. The agreement, in practice, by increasing agricultural exports to Europe and encouraging more cattle and soy production in the Amazon, Cerrado, and Chaco, can only make it harder to implement the Paris Climate Agreement, and much more difficult to keep average global temperatures from rising more than 2 degrees Celsius (3.6 degrees Fahrenheit), with likely catastrophic results. The Amazon rainforest, a vital carbon sink, may already be producing more carbon than it absorbs, largely as a result of deforestation and human-caused forest fires used to clear land for agriculture. This trade agreement, which will boost farm commodities exports from Mercosur, and mean the conversion of more forest to crop and grazing lands, will accelerate carbon emissions, which soared in Brazil by nearly 9 percent in 2016. A 2011 external impact assessment estimates the gains for the EU through increased exports of industrial goods could range between €21 and €29 billion. It states that the deal could enhance the EU’s GDP by €15-21 billion and Mercosur’s GDP by €2-3 billon. The trade deal between Mercosur and the EU has been in the pipeline off-and-on for almost two decades. Negotiations began in 2000 but were suspended in 2004 after substantial differences emerged between the parties concerning the level of liberalization of trade in agricultural goods, services and public procurement markets. With progressive governments in power in much of South America, many analysts thought the deal was dead. It is widely accepted today that the world cannot go on producing and consuming more and more meat without doing serious – and almost certainly irreversible – damage to the environment, and especially the climate. In the same week that Greenpeace leaked the Mercosur documents, analysts from Farm Animal Investment Risk and Return (FAIRR), which manages more than $4 trillion in assets, said that it seemed “inevitable” that within five to ten years some form of meat tax will emerge to curb consumption and limit the impact of the global livestock industry on greenhouse gas emissions. The industry contributes 15 percent of greenhouse gas emissions today and meat consumption is rising around the world. Jeremy Collier, the founder of FAIRR, said: “Far-sighted investors should plan ahead for this day,” advice that applies in equal measure to beef- and soy-producing countries. Yet, instead of encouraging Mercosur countries to develop truly sustainable agricultural practices that combine high production with ecosystem protections, while reducing carbon emissions, the EU-Mercosur trade agreement will likely encourage Latin American nations to rely ever more on primary exports – particularly beef and soy. 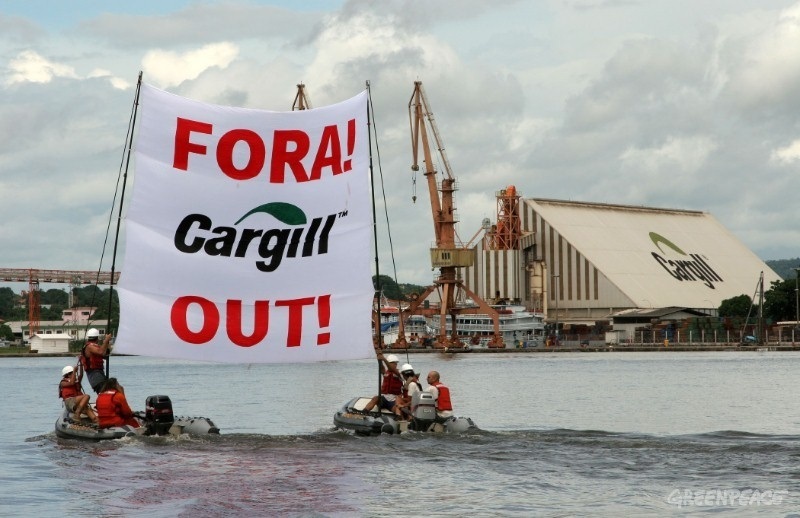 The new concern of EU politicians for upholding indigenous rights, even to permit trade embargoes against Brazil if the clauses are broken, is a positive development, but it will do little to mitigate the harmful impact of the EU’s growing reliance on soy and beef imports. While the Brazilian and Argentinian governments strongly support the deal, largely because of their politically powerful agribusiness lobbies, the Venezuelan government (formerly a Mercosur member) is fiercely opposed. Fernando Vicente Prieto, a member of the pro-government organization ALBA Movimientos, said that that this is the kind of accord that is “controlled by big companies and sets up cartels in the different sectors.” Although political differences may have played a role, observers believe it was Venezuela’s vehement opposition to the EU agreement that was the main factor that led to the suspension of its membership from Mercosur in October 2017.